(Wilmington, DE) Andrews & Springer LLC, a boutique securities class action law firm focused on representing shareholders nationwide, reminds shareholders of Snap, Inc. (NYSE: SNAP) (“Snap” or the “Company”) about the January 31, 2019 lead plaintiff deadline in the securities fraud lawsuit that has been filed in the U.S. District Court, Central District of California, Case No. 2:17-cv-03679, on behalf of investors that held shares between March 2, 2017 and May 15, 2017 (the “Class Period”). If you purchased Snap securities during the Class Period, you may, no later than January 31, 2019, request that the Court appoint you lead plaintiff of the proposed class. A copy of the complaint is available from Andrews & Springer LLC. If you would like to join the class action, please visit our website or contact Craig J. Springer, Esq. at cspringer@andrewsspringer.com, or call toll free at 1-800-423-6013. You may also follow us on LinkedIn – https://www.linkedin.com/company/andrews-&-springer-llc, Twitter – www.twitter.com/AndrewsSpringer or Facebook - www.facebook.com/AndrewsSpringer for future updates. Snap provides technology and social media services, and is the parent company of the popular Snapchat mobile application. Snap completed its initial public offering (“IPO”) on or around March 2, 2017, selling 230 million shares of stock to investors at $17.00 per share for gross proceeds of $3.91 billion. On May 16, 2017 a Snap shareholder filed a lawsuit in the U.S. District Court, Central District of California, which alleges that throughout the Class Period Snap and certain insiders issued materially false and misleading statements to investors and failed to disclose that: (i) Snap’s user growth and engagement, by minimizing the known adverse impact of competition from Instagram's Stories; (ii) the restatement of Snap's 2015 daily user metrics, by failing to disclose Pompliano's detailed, credible allegations regarding Defendants' knowing misrepresentation of its user engagement metrics and severe internal controls deficiencies; and (iii) falsely asserting that Snap did not employ "growth hacking" strategies to inflate user growth. Following this news, shares of the Company’s stock fell $4.93 per share, or over 21%, to close on May 11, 2017 at $18.05. 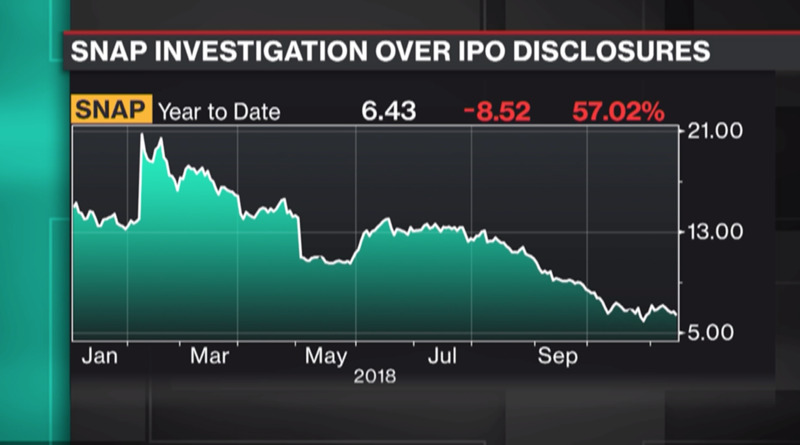 On November 13, 2018, Bloomberg reported that the U.S. Justice Department and Securities and Exchange Commission were investigating Snap’s accounting which misled investors ahead of its 2017 IPO. Following the SEC and DOJ announcement Snap’s stock fell 3.4 percent. If you wish to serve as lead plaintiff, you must move the Court no later than January 31, 2019. A lead plaintiff is a representative party acting on behalf of other class members in directing the litigation. If you wish to join the litigation, or to discuss your rights or interests regarding this class action, please contact Craig J. Springer, Esq. at cspringer@andrewsspringer.com, or call toll free at 1-800-423-6013. You may also follow us on LinkedIn – www.linkedin.com/company/andrews-&-springer-llc, Twitter – www.twitter.com/AndrewsSpringer or Facebook - www.facebook.com/AndrewsSpringer for future updates.